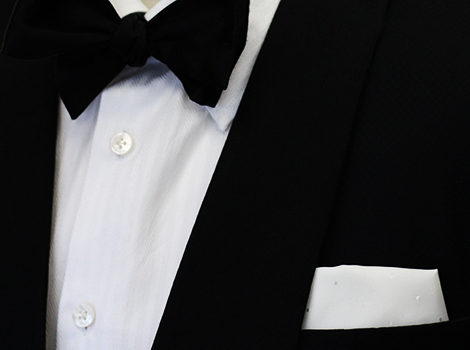 Formalwear is an overarching term for dinner suits, morning suits, white tie and other formal attire. The simplicity of these styles means that the cutting and fitting is all important. We ensure that every formal garment we make nods to its classical roots whilst ensuring it brings tradition firmly up to date. All our bespoke dinner suits are fully hand-tailored in the finest British cloth, and are complimented with pure silk revers of the finest quality. The first thing that stood out to me is the fit. The jacket hangs on me incredibly well, not tight, room to move and clearly sculptured in every direction to create a great outline. I hadn’t realised that wearing a bespoke jacket would feel so much different to all my other jackets. Des diligently advised on all of the detail. The attention to detail at every stage is phenomenal and an inspiration to watch. WHY GET YOUR DINNER SUIT FROM US? Our bespoke suits take a minimum of 75 hours (10-12 weeks) to complete. If you have a specific deadline in mind, please get in touch.